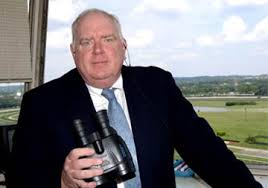 In honor of Tom Durkin’s retirement from race calling on August 31, we are taking a look back at 40 of his most memorable calls–one for each day of the 2014 Saratoga meet. Cigar’s 1995 season goes down as one of the greatest racing seasons ever. 10 for 10, 8 Grade I’s, 5 different tracks in 5 different states. But by far the most impressive was his Breeders’ Cup Classic win at Belmont. Not only was the field he beat impressive, but as Durkin notes, Mother Nature was against him as well. The sloppy Belmont track played against his strengths, as did his difficult 11 post but the “incomparable” Cigar would not be denied. When Jerry Bailey “said go”, Cigar made an impressive move on the far turn. Sweeping to the front, “invincible” to any challenge by the other mere mortal horses in the field. Cigar was indeed “unbeatable” that year, and showed the world why. The time of 1:59 2/5 might have been the most impressive performance in Breeders Cup history, considering the status of the surface. Durkin’s call will forever be stuck in this Thorobro’s mind, as an example of what horse racing excellence sounds and looks like.